THE ARLINGTON FREE CLINIC, in the American state of Virginia, is a world away from the treatment rooms of sub-Saharan Africa. Thanks to local doctors and nurses who donate their time to the clinic for people without health insurance, the patients get care akin to that in nearby private hospitals. They are fortunate: of the more than 1,000 free clinics in America, few are as well-run or offer such a broad range of services. And even in Arlington getting access is partly a matter of luck. The clinic holds a monthly lottery to decide which locals will be added to its rolls. Out of an estimated number of those without insurance of 20,000, the charity can offer free specialist care to only 1,650. Despite the passage of the Affordable Care Act in 2010, America remains an outlier in health-care provision. It has some of the best hospitals in the world, but it is also the only large rich country without universal health coverage. And health-care costs can be financially ruinous. America made a good start. Towards the end of the civil war Abraham Lincoln announced that there would be health provision “…to care for him who shall have borne the battle, and for his widow and his orphan”. At the time this was one of the largest government-backed health-care plans in the world. But America never followed rich European and later East Asian countries in introducing universal coverage. Today 10% of Americans below retirement age are without insurance (the elderly are covered by a government-backed scheme, Medicare), though the share ranges from 6% to 17% in different states. Historians offer various explanations, not least America’s strong culture of individualism. Many Republicans believe that health care is not a right but something people choose to buy (or not) in a marketplace. As Jason Chaffetz, a Republican congressman, put it, “Americans have choices. And they’ve got to make a choice. And so maybe, rather than getting that new iPhone that they just love, and they want to go spend hundreds of dollars on that, maybe they should invest in their own health care.” Another reason is resistance to reform by powerful interest groups. When nine of the ten best-paid occupations involve medicine, doctors have little incentive to change the system. 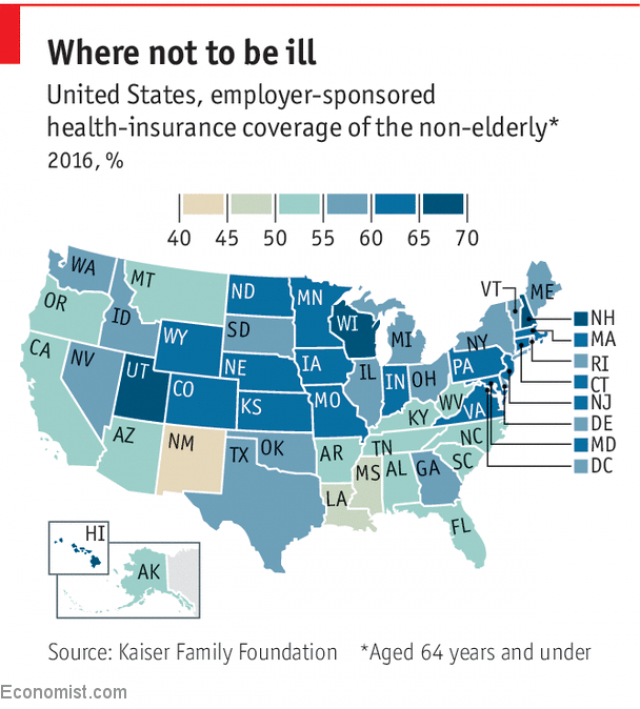 Perhaps more important, about half of Americans have their health insurance provided by their employers (see map). This resulted from a quirk of history. During the second world war President Franklin Roosevelt froze Americans’ wages but allowed companies to increase workers’ benefits, which they wanted to do to alleviate labour shortages. The share of workers with health insurance increased from 10% in 1940 to nearly 30% in 1946. That gave companies a stake in the system, which successive tax exemptions have helped maintain. So now America has a version of a problem seen the world over: voluntary insurance cannot ensure that everybody gets coverage. The Affordable Care Act expanded Medicaid—the health-insurance system for the very poorest Americans—and subsidised slightly less poor ones to buy health insurance in statewide marketplaces. This cut the number of uninsured people from 44m to 28m, but still left a gap among people not poor enough to qualify for Medicaid but not rich enough to buy private insurance. Following a Supreme Court decision in 2012 that allowed states to opt out of expanding Medicaid, 18 did just that, leaving more people uninsured. Last year the Republican-controlled Congress tried and failed to repeal the Affordable Care Act, but it keeps chipping away at some of its provisions. At the same time the Democrats were buoyed by their successful opposition to the repeal. “The Affordable Care Act was never popular until the Republicans tried to abolish it,” says a former policy adviser to President Barack Obama. Today the standard view among Democrats is that the time has come to travel the last mile towards universal health care. Polls for the Kaiser Family Foundation, a health think-tank, find that a slim majority of Americans now favour a “single-payer” system (usually meaning that government, rather than insurance companies, buys care from providers), with more support from those without a political affiliation. This is an important shift. The next Democratic candidate for president will almost certainly campaign under the banner of universal health care. Though broader coverage remains a Democratic goal, the main rationale for the party’s reform proposals is to cut costs for those who are already insured. According to a report published in 2017 by the Commonwealth Fund, a think-tank, 28% of American adults under 65, or 41m people, are underinsured, meaning that in addition to their insurance premiums they spend more than 10% of household income (or 5% for poor households) on topping up their health care. In 2016 America spent $10,348 per person on health care, roughly twice as much as the average for comparable rich countries, according to the Kaiser Foundation. That is 17.9% of GDP, compared with 10.7% elsewhere (see chart). America’s figure is so high partly because the country consumes more expensive forms of care, such as MRI and CT scans and elective surgery, but mostly because treatments cost more. On average, both hospital costs and drug prices can be 60% higher than in Europe, according to an analysis by the OECD in 2009. Higher costs reflect fragmented insurance markets, where consumers have little scope to negotiate. Fragmentation also means that prices for the same service can vary enormously. Having your appendix removed, for example, can cost anywhere from $1,500 to $183,000, depending on the insurer. Administrative costs are affected, too. Whereas the number of doctors increased by 150% between 1975 and 2010, that of health-care administrators rose by 3,200%. Most of the myriad plans floating around Washington, DC, are aimed at higher coverage and lower costs, but they differ on how to get there. In reports for the Century Foundation, a think-tank, Jeanne Lambrew and her colleagues have set out a range of ideas, which fall into four broad groups. The first are “single-payer” plans. One, proposed by the Democrat Bernie Sanders and supported by several presidential hopefuls, is “Medicare for all”, based on the existing scheme for pensioners. Medicare would eventually become nearly the only purchaser of care. A second group hopes gradually to widen access to Medicare, whether by lowering the eligibility age or making it available in places with few or no private insurers. Perhaps the most radical version was proposed in February by the Centre for American Progress, an influential centre-left think-tank. It would open up Medicare to everyone but allow people to keep their employer-based insurance plans so long as they offered Medicare-like benefits and prices. A third set would allow better-off people to buy Medicaid. Since Medicaid is administered by the states rather than the federal government, they would have to take the lead in achieving universal coverage. A fourth group involves various tweaks to the marketplaces introduced by the Affordable Care Act, such as government-backed reinsurance that would cap the out-of-pocket costs faced by people with private insurance. None of these schemes has been thoroughly costed. Ominously for Mr Sanders’s plan, even his home state of Vermont ditched the idea of a single-payer system in 2014. In California, ahead of the election for governor in November, those on the left, supported by a powerful nurses’ union, want candidates to sign up to a state bill for a single-payer plan. Privately, however, many policymakers worry about the cost of such a drastic change—and the likely backlash from people who would have to change their insurer. There is a lot of misunderstanding about what a single-payer system means. Almost half of Americans do not think they would have to switch insurers, but under Mr Sanders’s plan, for example, they would. Most Americans are satisfied with their health-insurance coverage, so a true single-payer system would be a hard sell, even before interest groups began campaigning against it. And there is no guarantee that changing to a single-payer system would lower costs, because providers will lobby hard to avoid having to cut their prices. Where America goes from here depends on what happens to health care during the rest of President Donald Trump’s term of office. With Congress and many Republican-run state governments trying their best to undermine the Affordable Care Act, the numbers of uninsured and underinsured Americans could rise over the next few years. If health care turns into even more of a mess than it is now, Democrats might try to introduce more radical reforms should they regain the presidency in the 2020s. By then yet more developing countries may have achieved universal health care, making America even more of an outlier.